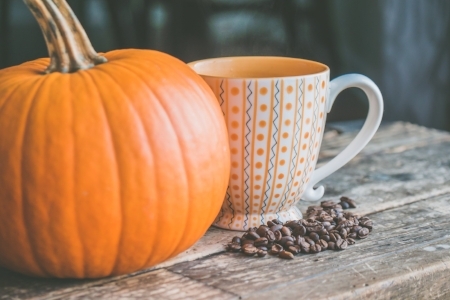 It is time to accept fall- and that means jumping on the Pumpkin Spice Latte train! Here is our recipe for a fresh, local take on this trendy fall season staple. Use your market haul to impress your friends with how relevant, and DIY savvy you are! This is also a great one to use up your leftover pumpkin puree from your pie or ravioli recipe. Mash pumpkin and set aside 1/4 c. - save the rest for a pumpkin pie or pumpkin ravioli! Heat milk, pumpkin puree, honey and spices in a saucepan over medium low heat for approximately 5 mins or until hot (but not boiling!). Stir often to combine and keep from burning! Remove from heat and whisk vigorously until it is foamy. Pour coffee or espresso into two large mugs and add foamed milk. Add whipped cream and caramel topping if desired!